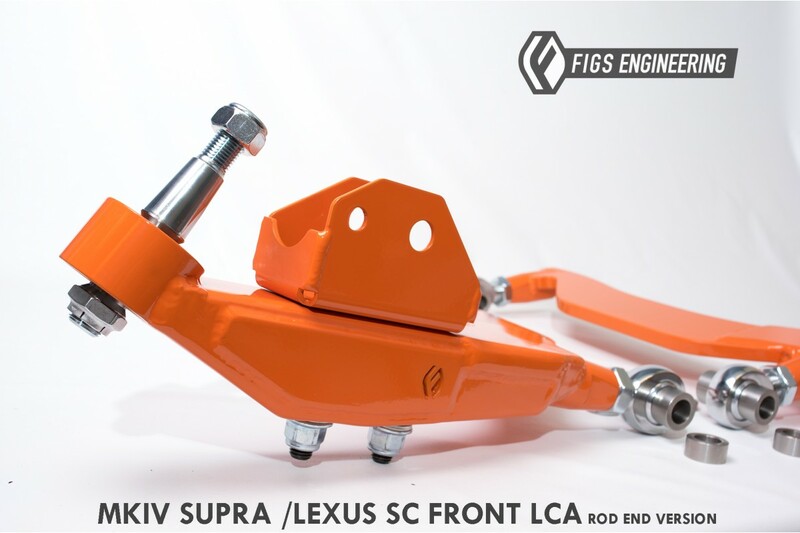 There has always been a problem with the front LCA on the Toyota Supra and Lexus SC, the ball joints. A perfectly good arm has to be scrapped when the outer ball joint fails. Even worse, if you have poly bushings you will then need to reinstall them in the somewhat perfect OE arms that you purchase. With OE stock running in short supply and threats of discontinued support, we decided it was time to make something better. 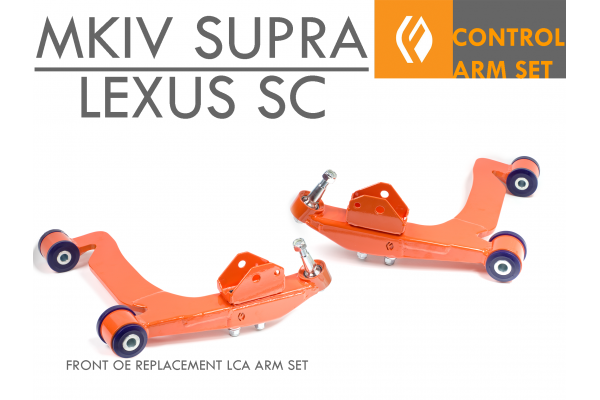 Introducing our OE replacement arms with serviceable outer ball joints. Several configurations available to suit a wide variety of needs. We have even integrated support for our lifetime poly bushings from SuperPro, so if you have these already, they will not go to waste. Rod end version add adjustment +/-2 degrees of camber range. -1 PAIR of arms, R and L with bearings and ball stud pre-asssembled. -8 bushings with grease or 4 rod ends with stainless spacers. -Shock mounting bracket and hardware. -Installation instructions will be available via our blog. Alloy Steel construction, made in the USA. Serviceable massive 7/8" outer bearing/balljoint is completely rebuildable. PTFE-lined FK bearing and 4140 monolithic taper stud with stainless HMA spacers. 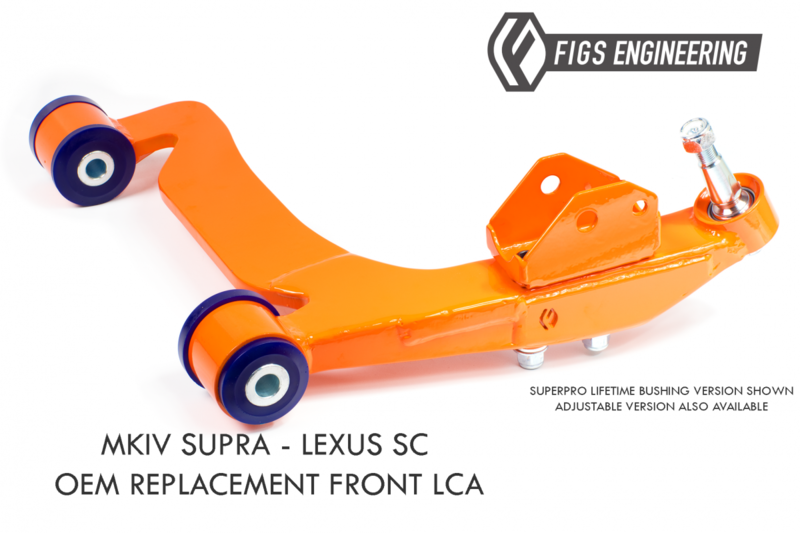 Optional SuperPro Liftetime inner bushings or our FIGS MOTO 2-piece rod end bearings for adjustment. MOTO or 3-P Precision inner 3/4" inner rod ends to support a variey of uses. MIG/TIG construction favoring the best cost to strength production. 100% TIG is an option in the dropdown. 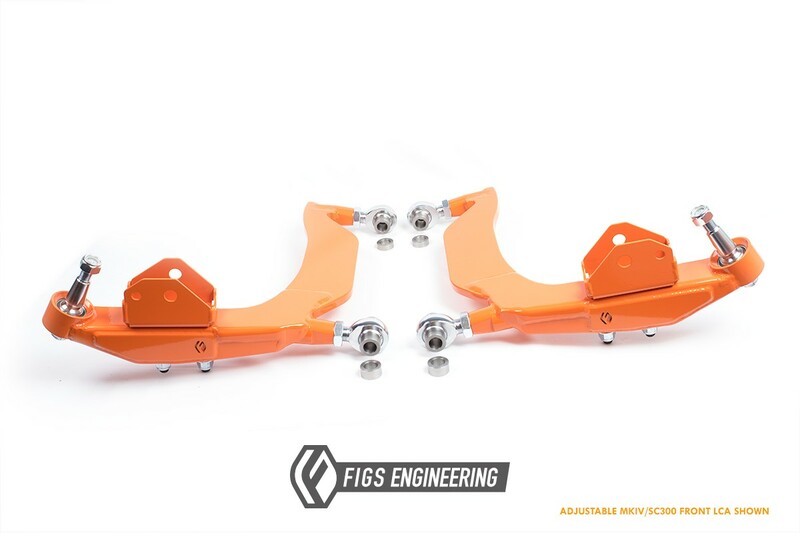 Arms feature a wider support arc for greater steering angle as well, for cars with modified knuckles that contact the OE arm. 4 degrees of adjustment on rod end version. Static bushing version offers lifetime warranty and uses SPF1404/SPF1403 combination so you can reuse your bushings if already purchased. SuperPro lifetime poly bushing or bearing at inner mount: Poly bushings will provide the longest service life and least maintenance. Suggested for the street. If you already have the SuperPro LCA inner mount bushing, then select "NO BUSHING" option to reuse your existing bushing. MOTO or Precision rod ends. MOTO rod ends are our reinforced injection molded-race rod end that is the most resistant to shock loads (the street). We suggest MOTO for street vehicles for the longest service life. Precision rod ends feature a PTFE fabric liner that is bonded to the inner race and provide a tighter interface to the ball. These are the highest performance rod ends but are less resistant to shock loads and may not be as durable in street applications. 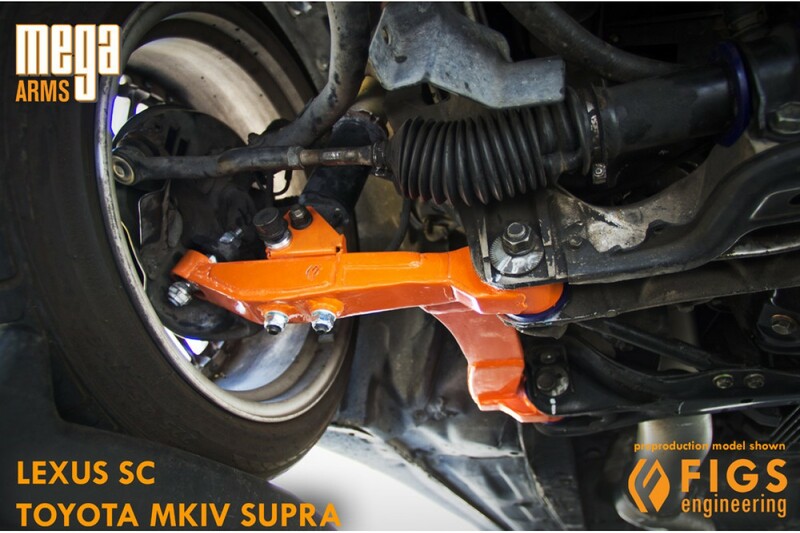 Sway Endlinks (coming soon): lowering any car can induce sway bar preload, our rear sway bar endinks are made with precision FK rod ends and stainless studs for long service life and durability. We are now in production mode, so leadtime is now only 1-1.5weeks dependending on our coating schedule. The maintenance of all rod ends and bearings should be with PTFE dry-lube. Never use a grease as it will break down the precise interface between the ball and race in the joint. All spare parts are available for rebuild, pricing is subject to parts required and circumstances. Contact us with any questions.